Written by Kent Paterson in the Texas Observer: "Oscar J. Martínez’s new book pushes back against the historical amnesia, toxic politics and stereotyping that have shrouded the city for decades." "A visit to Ciudad Juárez this spring quickly revealed the swirling contradictions in this turbulent city across the Rio Grande from El Paso. I saw crowded restaurants, new businesses, strolling families and street performers entertaining crowds. Juárez is no ordinary city. Its history is exhilarating and tragic. Part of the state of Chihuahua and located on the border with the United States oppo­site El Paso, Texas, Juárez has often captured the world’s attention in dra­matic fashion. In Ciudad Juárez: Saga of a Legendary Border City, Oscar J. Martínez provides a historical overview of the economic and social evolution of this famous transnational urban center from the 1848 creation of the interna­tional boundary between Mexico and the United States to the present, em­phasizing the city’s deep ties to the United States. Martínez also explores major aspects of the social history of the city, including cross-border migration, urbanization, population growth, living standards, conditions among the city’s workers, crime, and the circum­stances that led to the horrendous violence that catapulted Juárez to the top rung of the world’s most violent urban areas in the early twenty-first century. In countless ways, the history of Juárez is the history of the entire Mexican northern frontier. Understanding how the city evolved provides a greater appreciation for the formidable challenges faced by Mexican fron­terizos, and yields vital insights into the functioning of borderland regions around the world. OSCAR J. MARTÍNEZ is a Regents’ Professor of History at the University of Arizona. He has authored and edited numerous books and many articles, book chapters, and reviews. His most recent book is Mexico’s Uneven Devel­opment: The Geographic and Historical Context of Inequality. Have you been wondering about the relationship between Mexico and the US--especially since all the Trump foolishness--yet don't want to commit to an old fashioned textbook? Try Oscar Martinez' easy to comprehend 30 page booklet. It's even got maps! This booklet explores the role of the United States in shaping the destiny of the Mexican people. Historically the United States has exerted overwhelming influence over the way that Mexico has developed economically. 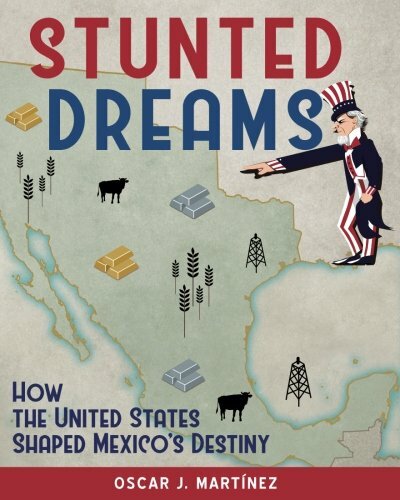 In the mid-nineteenth century the United States undermined Mexico’s long-term development by dispossessing its neighbor of its most valuable lands, imposing a border that has heavily favored U.S. interests, and paving the way for the dominant U.S. economy to compete more directly with the much weaker Mexican economy. As a result, Mexicans have had to struggle to build their country under the shadow of the powerful United States, not unlike small retailers who try to survive in the face of crushing competition from a Wal-Mart megastore located uncomfortably nearby. The booklet is sold on Amazon for $9.95 and $6.99 for the Kindle edition. All proceeds go to the nonprofit programs of the El Paso Social Justice Education Project.